While the launch of the Fiat 500 did draw some interest, Fiat's only slooooooowly followed that up with a single new product and a couple of variations. This has led to flat demand this year and profitability for just 45% of stores, reports Automotive News. Even worse, many of those profitable stores are probably only profitable because they're splitting costs as part of a larger Chrysler/Dodge dealer, despite an initial request by Fiat that all stores be standalone. 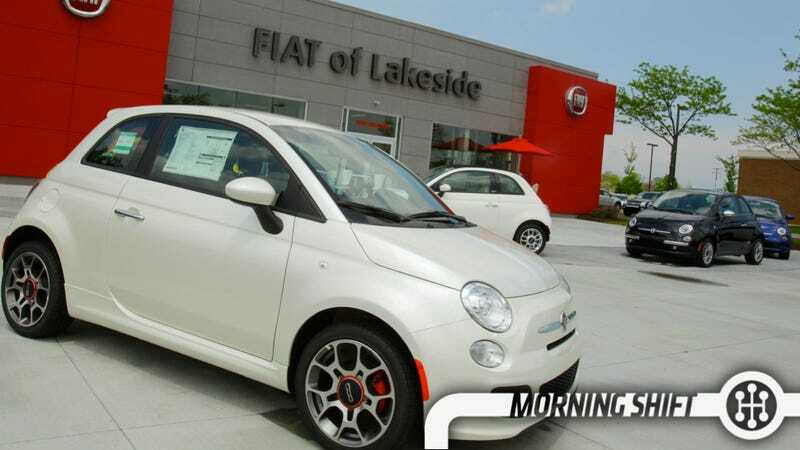 Dealers in the U.S. seem to feel like Fiat was touted as a big deal before it rolled out but, since then, the company has had other things to worry about. Now that the Alfa 4C might be sold by Maserati there's even less for Fiat dealers to look forward to. What's the answer? More product? How is Fiat different from Dodge? One point I haven't seen get made as people debate the UAW Trust/Chrysler/Fiat IPO mess is that maybe it's not a terrible idea if there's a third party to interfere. Give this Freep piece a read and maybe it'll sway you to think an IPO isn't the worst decision. While everyone would agree that Fiat has been a far better steward of Chrysler than Daimler or Cerberus, we've only seen this debate from the perspective of either the UAW or Fiat. But what about Chrysler itself? Sergio Marchionne might hate the idea of having someone else meddling in his plans, and he's promised he wouldn't use Chrysler to bailout Fiat, yet that's already sort of happening. A third voice who cares about Chrysler isn't the worst thing ever. While they can scarcely sell any SRT Vipers, the 2014 Corvette is experiencing such high demand they're probably a few months away from just having them on dealer lots. Why not add a second shift, then, to Bowling Green? "We've seen this again and again. You bring out a new Corvette and the demand is sky-high at the beginning, and then it tapers off," said Corvette Chief Engineer Tadge Juechter. "It's not worth making that investment [of a second shift], even though for awhile we make a lot more money getting those cars out there." That's from Automotive news, who goes on to say that they think they can sell 160 a day for the next six months. This is the smart play, they may lose a small amount now, but incentives will stay low and demand will continue to be fed. GM wants to sell you a car and they want you to be able to do find it, customize it, settle a price, and get it delivered all without having to step into a dealership. So how is this not another Tesla in the making? As the WSJ explains, the sales still go through dealers. It's called Shop-Click-Drive and it's not a replacement for the dealer, so much as "an electronic door its independent brick-and-mortar" dealers. I think this is smart. Young buyers don't want to deal with the hassle any more than older people do, but they're probably more willing to trust buying a car this way since they already buy everything else with a MacBook Air. An early Must Read from Karl Henkel this morning, who talks about the evolution of Henry Ford's assembly line. The assembly line created hundreds of thousands of well-paying jobs, but made others obsolete. It has refined car and truck manufacturing, improved quality and safety of cars around the globe, and duplicated its efficiencies to other industries such as aircraft. Reverse: Time For A Reboot! On October 7, 1960, the first episode of the one-hour television drama "Route 66" airs on CBS. The program had a simple premise: It followed two young men, Buz Murdock and Tod Stiles, as they drove across the country in an inherited Corvette (Chevrolet was one of the show's sponsors), doing odd jobs and looking for adventure. According to the show's creator and writer, Stirling Silliphant (best known for his acclaimed "Naked City," an earlier TV series), Buz and Tod were really on a journey in search of themselves. "Call 'Route 66' 'Pilgrim's Progress,'" Silliphant told a reporter. "The motive power driving our two characters is not a Corvette: it is the desire for knowledge—and for sentience; it is a quest through the perennially fascinating cosmos of personal identity." Neutral: Would You Buy A New Car Wholly Online? Or do you still prefer a dealership?